Northern Exposure bedding ranks among the top favorites for those who want to add a bit of rustic decor to there living space. color include tan, burgundy and dark green on a light cream background with coordinates in dark green and cream check. Northern Exposure bedding ranks among the top favorites for those who want to add a bit of rustic decor to there living space. color include tan, burgundy and dark green on a light cream background with coordinates in dark green and cream check. Made of 50% cotton and 50% polyester. 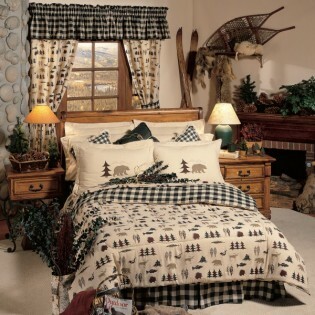 Comforter Sets include: 1 comforter, 1 bedskirt and 2 pillow shams (1 with twin). EZ Bed Set includes: 1 comforter, 1 bedskirt, 2 pillow shams (1 with twin), 1 top sheet, 1 fitted sheet (fits mattresses up to 13" deep) and 2 pillow cases (1 with twin) Sheets are 180 thread count.